To be abstract is to deal with ideas rather than things, to be free from representation, art’s age-old purpose. 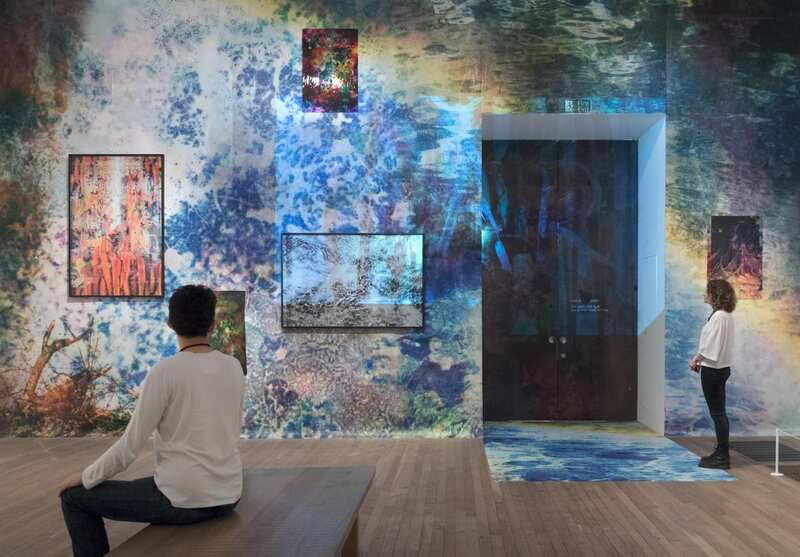 On now at the Tate Modern, London, Shape of Light seeks to map the interplay between those artists who have pursued abstraction using brushes to shape paint and those who have chosen cameras and darkrooms to shape light. 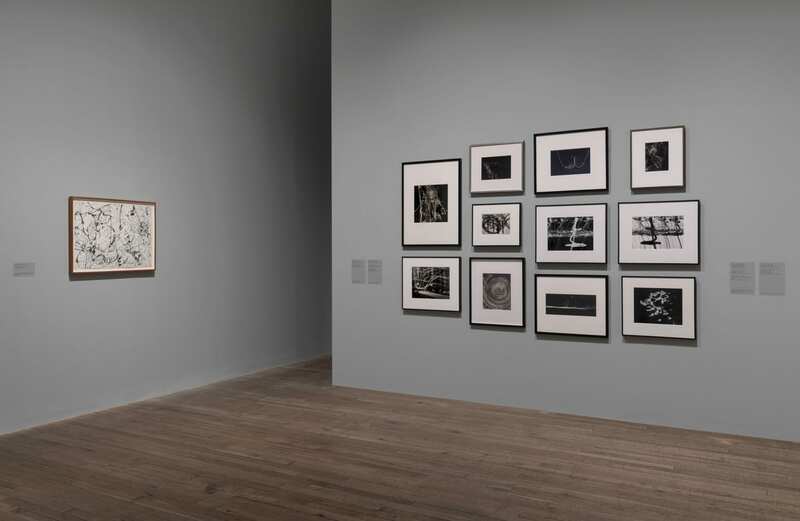 The exhibition endeavours to foreground photography’s key role in the development of abstract art. Any effort to compress a century of art history into a dozen rooms is likely fraught with difficulty. The approach taken by lead curators Simon Baker and Emmanuelle de L’Ecotais is to proceed room by room, placing a key abstract painting or sculpture in each, alongside photographs that can be said to respond to each work. “These photographs prioritise shape, form and expression over recognisable subject matter.” Yet too often in this show what we see is merely pattern, or rather a pattern: 100 years of photography trying to look like abstract painting. Trying, without ever threatening the primacy of the latter. While photographic techniques and mysteries are patiently explained, the paintings present are left simply to be. Everywhere one sees photographers paying homage to painters, nowhere the reverse. A fact which speaks inadvertent volumes. 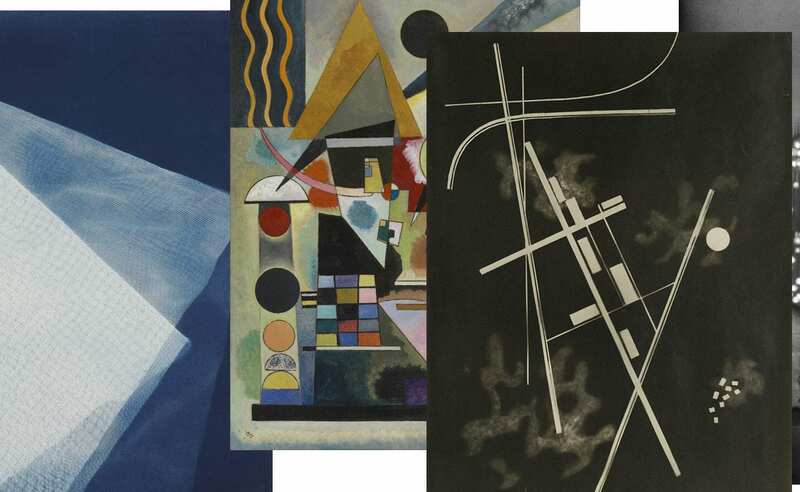 There is no better illustration of this than the pairings in the very first room, wherein we find Wassily Kandinsky’s Swinging (1925), and Marta Hoepffner’s Homage to Kandinsky (1937), the latter a flat and pale pastiche of this bright, dynamic painting. The same effect is repeated by the pairing of German Lorca’s insipid Mondrian Window (1960) with the hard brilliance of Piet Mondrian’s Composition C (No.III) with Red, Yellow and Blue (1935). These responses add nothing to our appreciation of the works that inspired them, and manifestly cannot stand apart from them. In room two Alfred Stieglitz warns us that “Unless photography has its own possibilities of expression, separate from those of the other arts, it is merely a process, not an art.” On the evidence of this exhibition, photography is all too often a process for replicating discoveries made elsewhere. And for doing it A LOT. This room also contains Paul Strand’s elegant Abstraction, Porch Shadows, Connecticut (1916). But that Strand felt the need to identify the source and location of his ‘found’ abstraction is mystifying. Stieglitz again, “There is more of the really abstract in some ‘representation’ than in most of the dead representations of the so-called abstract so fashionable now.” Yes, and many of those so-called abstracts are on view here today. YOU MIGHT ALSO LIKE: Brad Feuerhelm: Photography Class of 2016? New Vision, the third room, chiefly presents efforts by Aleksander Rodchenko and László Moholy-Nagy “…to create an independent photographic language.” The irony being that Moholy-Nagy’s painting K VII (1922) far outclasses his photographs and is bettered only by painter Theo van Doesburg’s Counter-Composition VI (1925), thus disproving the point the curators have laboured so hard to make. Room four presents collage and photograms designed to defamiliarise and make strange. Is this abstraction? The suggestion is of photography moving beyond the reproduction of reality and toward its production, thanks to the deft manipulation of light, chemicals and paper. But yet again, the work that makes strangest is not photographic, being Jean Arp’s singular sculptural relief Constellation According to the Laws of Chance (c.1930). Finding Form in room five offers us our first chink of light, in the shape of György Kepes’s chemigrams. “The resulting images are truly abstract, produced only to be captured on film with no referent in reality.” An admission that all we had previously seen are only half-baked abstractions? The large blue Painting (1927) by Joan Miró reminds us that painting’s chief advantage at this time was ready access to colour. Although room six sees Jackson Pollock’s shogun-like Number 23 (1948) eschewing bright colour and still absorbing far more attention than the dozen photographs arrayed ninja-like against it. “Oh, it’s another roomful of black & white photographs,” someone moans as they enter room seven. Relief finally arrives in the following room, thanks to a dash of colour in Harry Callahan’s Chicago (abstraction) (1951). Here are also to be found Aaron Siskind’s timeless images of anonymous brush strokes and peeling paint on city walls, together with Found Painting (1949) by the the under-exposed Frederick Sommer. Both evidence for Stieglitz’s earlier assertion that photographic representation often contains the truest abstraction. Room nine presents a show within a show. “A homage to and partial recreation of The Sense of Abstraction, a photography exhibition which opened at MoMA in 1960.” This worthy plod is leavened only by a letter from Minor White to the curator of the aforementioned exhibition, in which the photographer amusingly asserts that his images are “not abstractions in any sense whatsoever” and their resemblance to painting is merely coincidental. This room should also be seen, if for no other reason than to view Man Ray’s much ripped off Anatomies (1930), the Funky Drummer of photography. Optical Effects in room ten presents photography in the context of the rise of Op Art, with photography finally unbound, free to create rather than reproduce. Sadly, frustratingly slight attention is paid to the fascinating chemigrams of Pierre Cordier and the concrete photography of Gottfried Jäger, either of whom could surely have mounted absorbing capsule shows. That said, Bela Kolářová’s Objective Photograph (1962) offers thoughtful counterpoint to Bridget Riley’s eye-popping Hesitate (1964). Something like momentum sees Minimalism and Series follow, with the claim that “art should have its own reality and not be an imitation of anything else.” Form over subject. This room could have been a show in itself, in fact there are at least three or four shows that could have been built from mere fragments of it. Essential works include Ellsworth Kelly’s pre-Sugimoto Movie Screen, Waterbury (1982), and the even finer San Jose (1972) by Lewis Baltz, a photograph which amps the drained quotidian to an almost mystical pitch. Not really abstract, but nevermind, neither are Ed Rushcha’s car parks and they’re here to. John Hilliard (conceptual, not abstract!) and Barbara Kasten are also welcome, the latter painting photosensitive chemicals to paper before moving and folding textiles to create near-moiré cyanotypes. The former, well, isn’t it really time he had a solo show here?! His Seven Representations of White (1972) while hardly fitting the show’s remit is nevertheless one of the most memorable works on view. The final room seeks to present contemporary abstraction, ranging from Untitled (Uranium Green), Sigmar Polke’s sickly 1992 (contemporary?) series of photograms of chunks of uranium – rendering the unseen visible – to Alison Rossiter’s delicious series of prints from expired photographic paper, Gevaert Gevaluxe Velours (2017), which engages with the history of photography, minimalism and conceptual practice to create serious, sensitive and beautiful work. Superficial in the best sense. From here onward digital and darkroom are united under the banner of an expanded photography with performative production. The puff is that the following folks are beyond merely photographic abstraction. Instead they have entered a braver new world. They are art and they are clever. There are problems with this (aside from the absence of the most prominent contemporary photographic abstractionist, Wolfgang Tillmans). The first is that Antony Cairns is a surprising presence and one that calls into question the authority of curatorial judgement by virtue of the social proximity of artist and curator, and professional proximity of private gallery and museum. We have to ask why Cairns’ deeply repetitive series of bleary night-time cityscapes on gimmicky E-ink screens, E.I. CTY1 (2018), is allowed to sprawl across so many acres of museum real estate, at the expense, presumably, of others who don’t DJ with the show’s chief curator, let alone grab the catalogue cover and poster for the exhibition. An excess of generosity only surpassed by the inclusion of Maya Rochat’s incoherent, elevator-abstraction. By contrast, Daisuke Yokota’s austere Inversion (2015) is serious. Mysterious. Definitely going somewhere. So, in every room where a painting faces photographs, it is the painting that holds the eye and thus the mind. While painting is never not leading, photography is forever jumping through hoops in order to look like the painting it so often seems to want to be. Sadly, what gems we see (and gems there certainly are) are tarnished by the crowds of ‘me too’ works. The desire to exhibit work by every photo-name who ever dabbled with abstraction appears palpable. Albeit this seems not to extend to too many female photographers (where is Berenice Abbott?) or any of colour. Shape of Light: A Hundred Years of Photography and Abstract Art is on display at Tate Modern, London, until 14 October 2018. Posted in Art, Other, Reviews and tagged Aaron Siskind, Abstract Art, Abstraction, Alexander Rodchenko, Alfred Stieglitz, Anthony Cairns, Ed Ruscha, Exhibitions, Jackson Pollock, John Hilliard, László Moholy-Nagy, Lewis Baltz, London, Man Ray, Maya Rochat, Nick Scammell, Photography, Piet Mondrian, Sigmar Polke, Tate, Tate Modern, The Shape of Light, Wassily Kandinsky.